Watch the video featuring students who are fostering puppies. Crumbs from dog treats line all of Céline Taillefer-Travers pant pockets. The floor of her office is littered with gently chewed dog toys, and the sound of soft panting is a constant reminder of an office mate who is never very far away. Edge, a one-year-old Labrador mix, isn’t a pet – he’s in training to become a companion for either a child with autism or a veteran suffering from Post-Traumatic Stress Disorder – and is a foster puppy with the National Service Dogs (NSD) organization. Taillefer-Travers, an academic program assistant at Laurier’s Brantford campus, is among several foster puppy parents at the university. She decided to sign up with NSD after talking to a foster puppy parent at a mental health event. 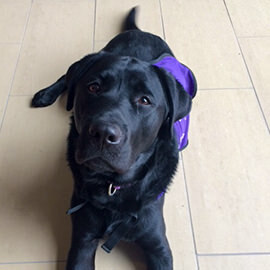 At Laurier’s Waterloo campus, Kevin Swinden, an associate dean in the Faculty of Music, and his wife are foster parents to a puppy named Viv through the Lions Foundation of Canada Dog Guides’ program. They were inspired to help by close friends who were also volunteering with the program. “It was close friends who inspired us, but it was their 11-year-old daughter who displayed such emotional maturity when it was time to let the dog go that convinced us we could do it,” said Swinden. Viv, a purebred black Labrador, will be with them for up to a year, and once she graduates, will be assessed for further training in one of many roles, including as a seeing-eye dog, for the hearing-impaired, for seizure response, to help children with disabilities, for autism assistance, or as a diabetic alert. All of the handlers are expected to teach the dogs some basic commands, but their key role is in socializing the pups, and often that means being out in the community where they are often inundated with questions. Taillefer-Travers said it has been nice because she has met a lot of new people on campus. However, it can be challenging when people don’t understand how inviting their body language can be. It is not just Laurier faculty members who are enjoying training their service dogs. Roommates Katie Telfer, Christine Hansen and Jessica Anam are among several Laurier students fostering puppies. While they are teaching eight-month-old Mocha how to behave, she is teaching them the importance of prioritizing. The students say they will be sad when they have to say goodbye to Mocha, but they are prepared. Taillefer-Travers is also preparing for the day when Edge is paired with a family, but hopes to keep in touch with them over social media. “I think it will be harder for my husband because I’m the boss – I have to keep an emotional distance from the dog. But when we come home, the two of them just hang out,” she said. Swinden said people often tell him they would never be able to foster a service a dog because it would be too hard to give up the dog at the end of the program. If you see a puppy in a vest (purple for NSD and green for the Lions Foundation), the dog is working and shouldn’t be distracted or approached. Always talk to the handler instead of the dog. If you would like to pet the dog, always ask the handler, but don’t be offended if the answer is no.